The lady golfers, who participated in the 16th Business Today-Honda Pro-Am of Champions this year, cannot be accused of lacking ambition. They not only outpaced the gentlemen golfers they played with, but showed the corporate participants a trick or two on how to play the game better. For the first time in its 16-year history, India's oldest and - till recently - only stand-alone Pro-Am shifted its focus to the Ladies Tour. The two-day national finals, held at the Classic Golf Resort in the National Capital Region (after the regional legs in Bangalore, Mumbai, Kolkata and Chandigarh had been completed), marked the reinvention of the country's most popular Pro-Am. For the first time, 16 lady professional golfers (eight from home and eight others from Thailand, Canada, the US, Germany and Dubai) and another eight lady amateurs teed it up with over 130 corporate movers and shakers for what is now the most lucrative tournament (excepting the flagship Women's Indian Open) on the women's professional circuit with a total purse of $20,000. Going by the tremendous response, the ladies made the most of the opportunity to establish their presence. "It is the first time that we are playing with women pros and this is nice and different. I am surprised by just how well they hit the ball," said self-confessed golf addict Vijay Chauhan, Chief Managing Director, Parle Products, adding, tongue in cheek, that he has more fun playing now that "Parle has overtaken Britannia in business". Anil Mehra, Managing Director, The India Today Group, revealed that the move to bring in lady golfers was aimed at supporting the fledgling women's golf tour in India. "We have done our bit for the gentlemen golfers. Most of India's successful (gentlemen) golfers - Ali Sher, Rohtas Singh, Mukesh Kumar, and more recently S.S.P. Chowrasia, Gaganjeet Bhullar, Anirban Lahiri, Ashok Kumar and C. Muniyappa, have participated in the BT Pro-Am and are now well established. 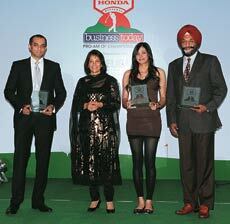 Now Business Today and Honda have decided to register another first: support Indian lady golfers and create a unique event where top Indian lady professionals and amateurs play with a field of international lady golfers, together with India's business leaders. 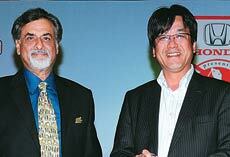 Our endeavour is to create champion women golfers who will put India on the world map," he added. Tatsuya Natsume, Director, Marketing, Honda Siel Cars India, said the association with women golfers was perfectly timed for his company. 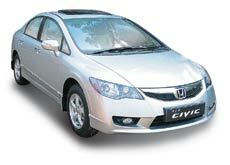 "All golfers are potential buyers of Honda cars. It is nice to generate product knowledge through this game. Here we are associating with women golfers because we want more women buyers for our upcoming small car, the Brio," he said. Playing with the ladies also had an unprecedented effect on the level of competitiveness. "We can match their (lady pros') driving so I think it makes us feel that we actually have a chance competing against them. The men (pros) would hit it so much further than us that it used to be difficult to give them any sort of competition," said Rahul Khanna of Cleveland Golf, who played with 2010-11 Order of Merit leader Sharmila Nicollet on the first day. Nicollet, one of the longest drivers amongst the pros (she averages 275 to 280 yards off the tee), was delighted with the conditions at the Classic Golf Resort. "The course is in fabulous shape. As long as you can drive it well, there are plenty of opportunities for making birdies out there," said the statuesque pro from Bangalore. Even though a massive traffic snarl on the Jaipur highway delayed the tee-off by a couple of hours on the first day, the participants got into the swing of things in no time. 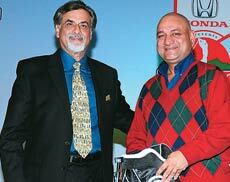 Harinder Sikka, Director, Corporate Affairs, Piramal Healthcare, and a consummate golfer, could not have been happier. "I play twice a week. This not only helps in making friends but also in understanding whom to keep a distance from," said Sikka ominously. On the other hand, Gautam Bhandari, Managing Director, Morgan Stanley, enjoyed a rare day on the course. "These days I barely get to play golf, but this is refreshing. I am playing the first round this year and the season is almost towards its end." Also seen in action were Shubhodip Pal, Country Head, Blyk India; Ashish Bharat Ram, Managing Director, SRF Ltd; Sunil Dutt, Country Head, HP; Rajesh Sud, CEO, Max New York Life; and Niraj Singh, COO, Vodafone. In the end, it was the sixhandicapper from the Delhi Golf Club, Millie Saroha, who guided a high-powered fourball comprising Harsh Gupta, Chief General Manager, Marketing, Solaris Chemtech; Sunam Sarkar, Chief Financial Officer, Apollo Tyres; and S.K. Tomar, ACP, Delhi to victory in the team event with a formidable tally of 115 points. The long-hitting Nicollet teamed up with Gen. (Retd.) K.M.S. Shergill, Executive Director, First Circle Financial Services; Rahul Maroli, General Manager, Commercial Lease Plan; and H.S. Chadha of Ritco Group to finish a close second, with a team total of 114 points. No one in the field could match amateur Gauri Monga, who won the event on the back of a stupendous four-under 68 on the first day, which was the lowest round of the tournament and propelled the 17-year-old to a two-day total of three-under-par 141. Her performance underscored the quality of play amongst the top amateurs, who have been giving the pros a run for their money. In this case it was even better: veteran Smriti Mehra and Elisabeth Esterl from Germany finished tied at the top of the pro leaderboard with identical scores of one-over 145 over two days. Akriti Singh with a score of two-over 146 shared overall third place with Thai pro Ajira Nualraksa, The BT-Honda Pro-Am of Champions 2011 came to a close with a glamorous evening at the Hotel Grand in the capital, which seemed more like a Page Three gathering rather than a golf tournament awards dinner - with the lady golfers shedding their golf garb for dazzling evening wear. Aroon Purie, Chairman & Editor-in-Chief, The India Today Group; Rekha Purie, Chairperson, Vasant Valley School; Honda Siel's Natsume; and The India Today Group's MD Mehra gave away the prizes to the winners. 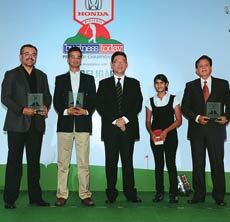 By deciding to partner with the Women's Golf Association of India (WGAI), the tournament title sponsor Business Today and co-title sponsor Honda Siel Cars India have again created a unique brand identity for the BT Pro-Am of Champions differentiating it from other corporate golf events in the country. Religare Enterprises was equally steadfast in its support as associate sponsor for the tourney. Cleveland Golf continued its relationship as equipment partner, while United Spirits, as liquor partners, kept everyone's spirits high. Golf Digest India was the official magazine for the tourney, which was supported and accredited by the WGAI.